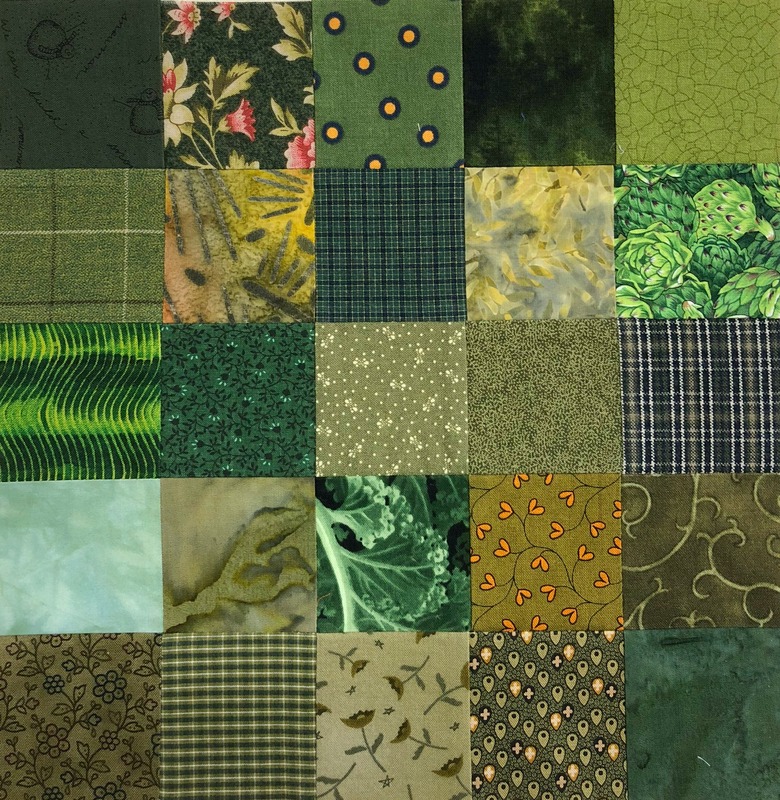 A wonderful friend passed on a boat load of fabrics to me. I could keep what I wanted and pass the rest on. It was also perfectly fine if I kept all the fabric and so I have!! 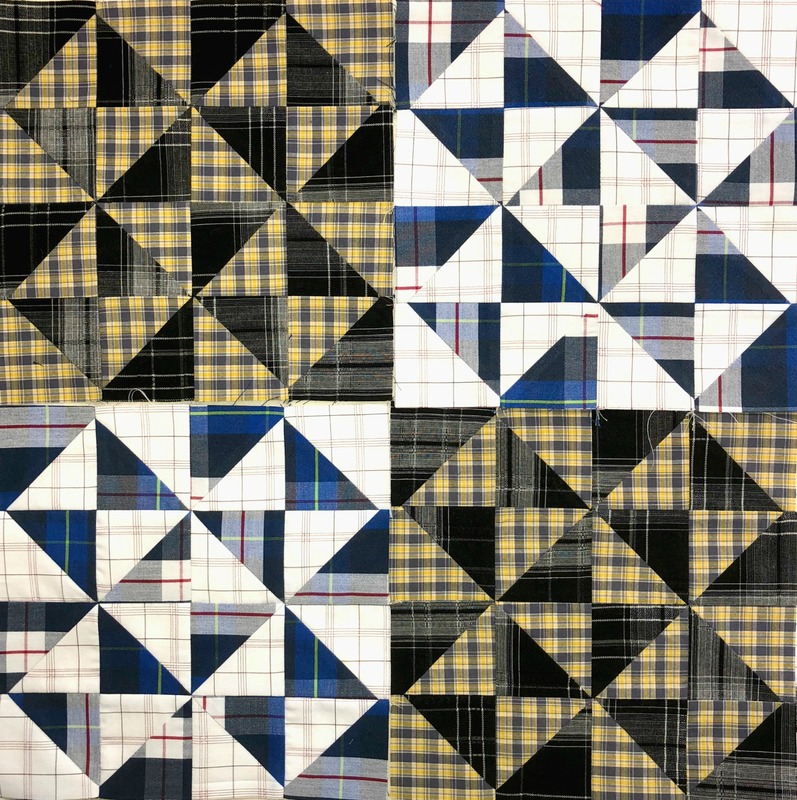 I have plans for two quilts exclusively from Lois’ fabrics. 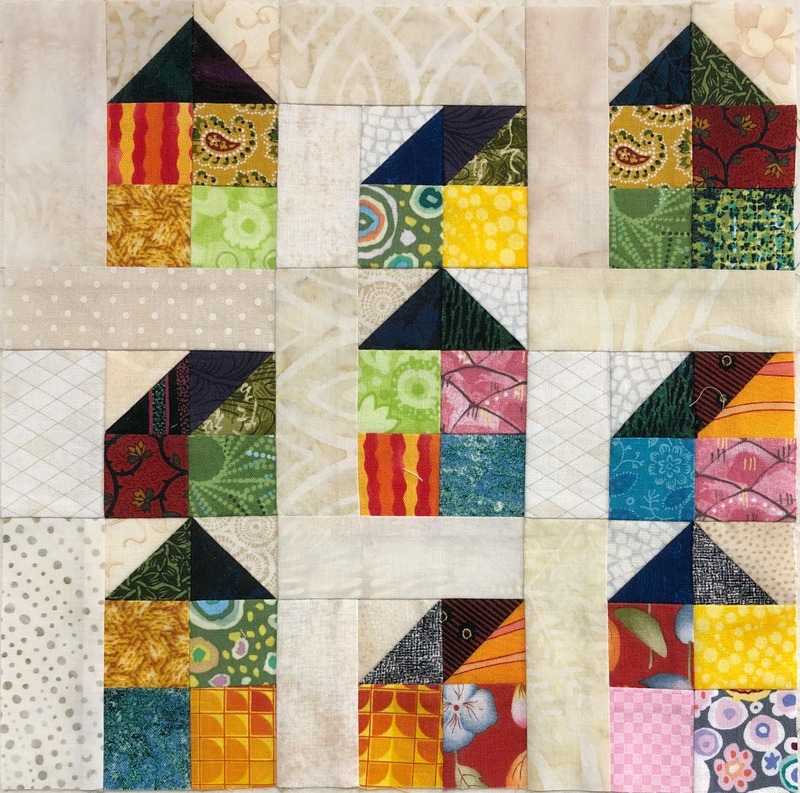 I’ve been cutting a bit here and there and finally sewed up the first block for Vintage Village by AQS. 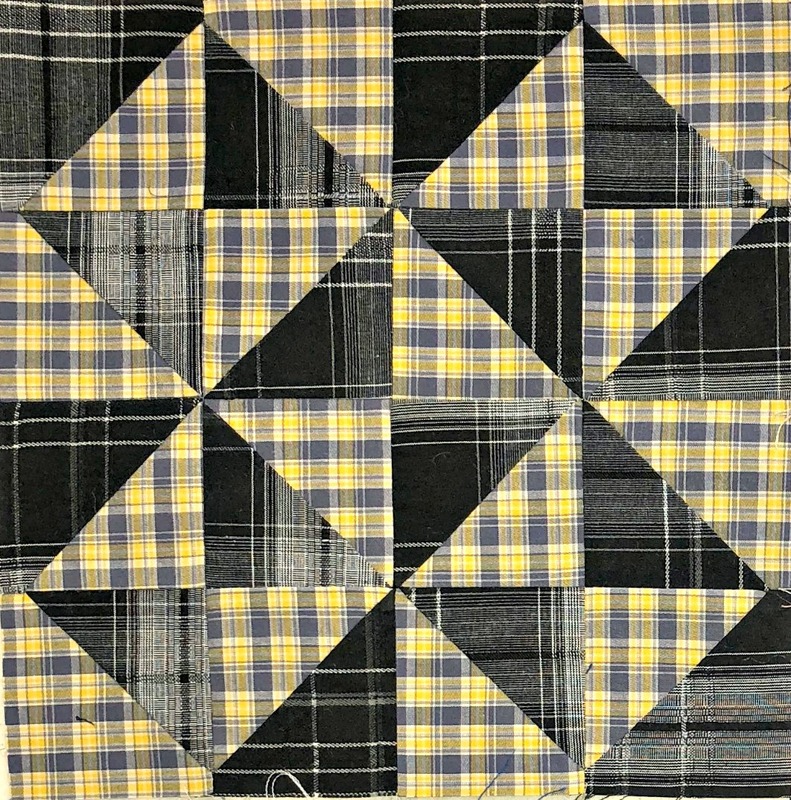 With Lois’ fabrics, the village will definitely not be vintage 😉 This is a 9 1/2″ block. 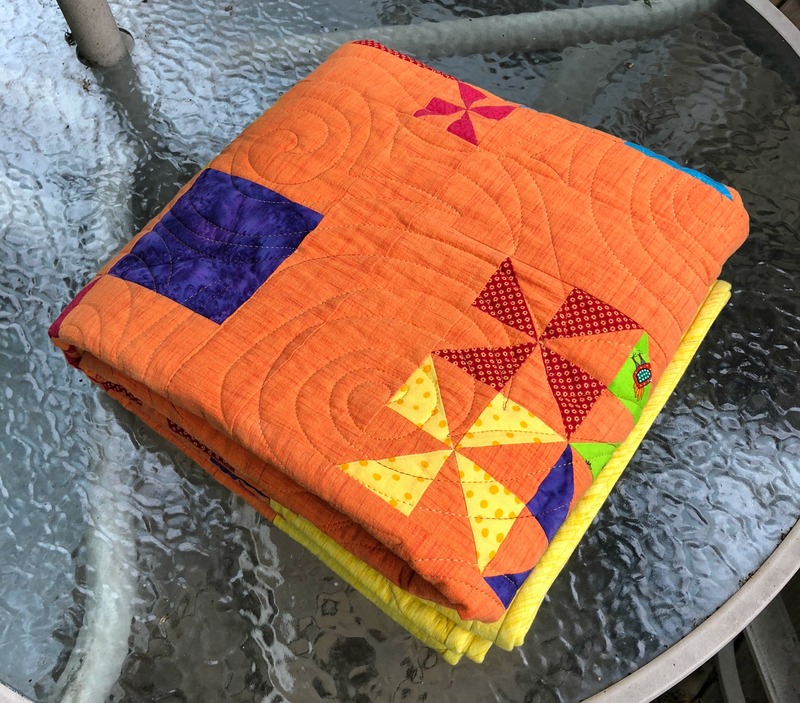 I’ve been participating in the Rainbow scrap challenge this year but haven’t gotten my act together for a Saturday post to link up in forever! My broken dishes blocks are finished. These are made from thrifted shirts and you might not be able to tell but even the stripes on the white shirts are dark green. 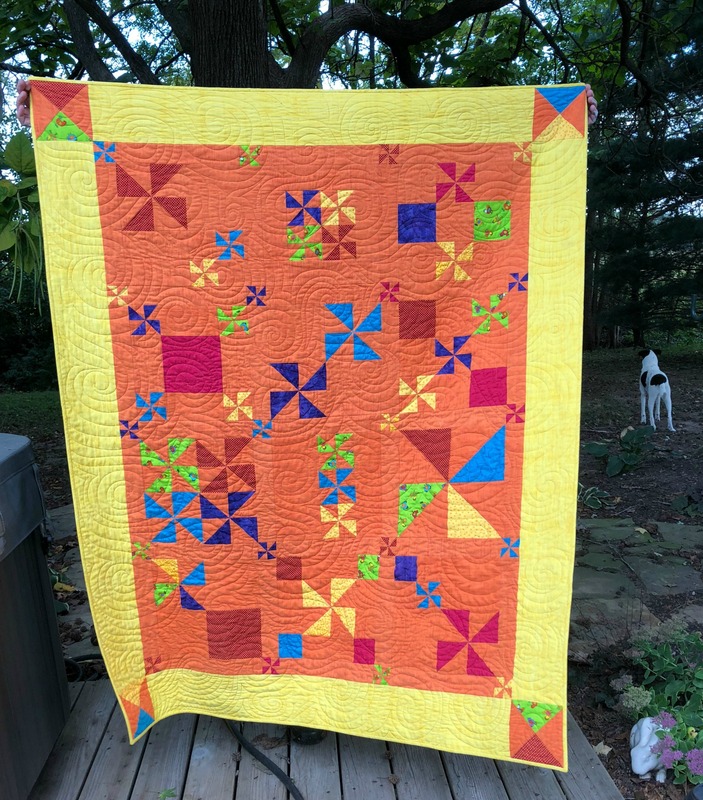 I finished one of my oldest UFO’s. 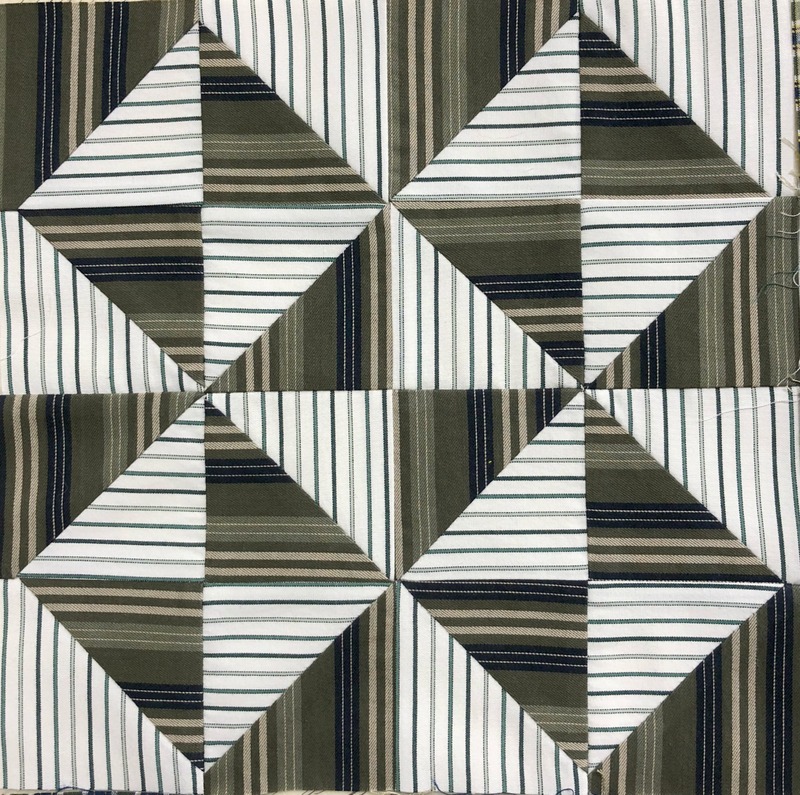 It’s Pinwheel Party, an on-line block of the week from Twiddletails, started in March 2010 with the top sewn together in Feb 2014. 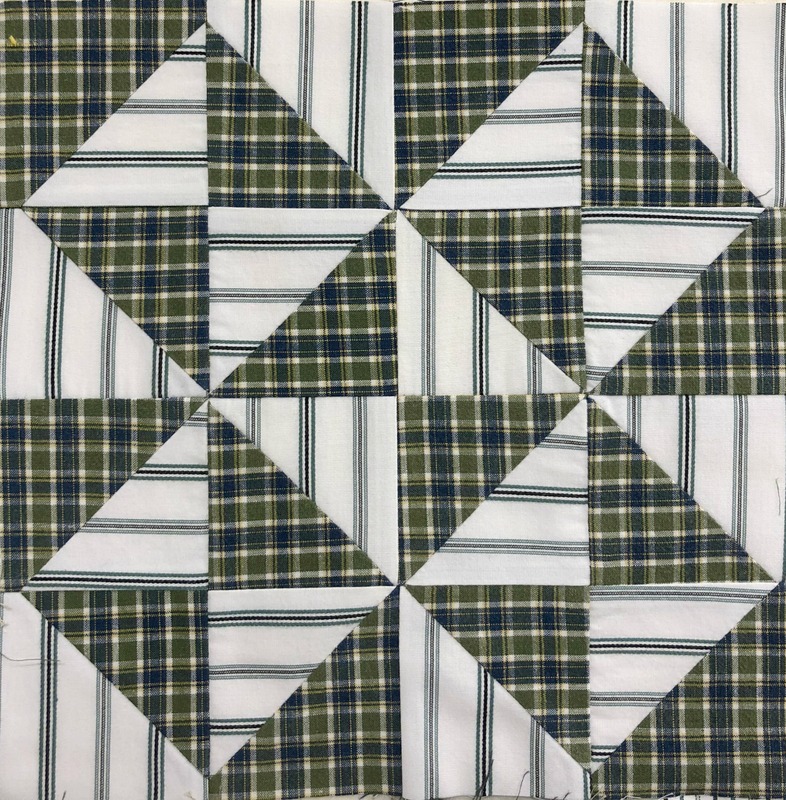 I ran out of the background fabric that, per the pattern, was used in final border and I just couldn’t settle on what to do about that. 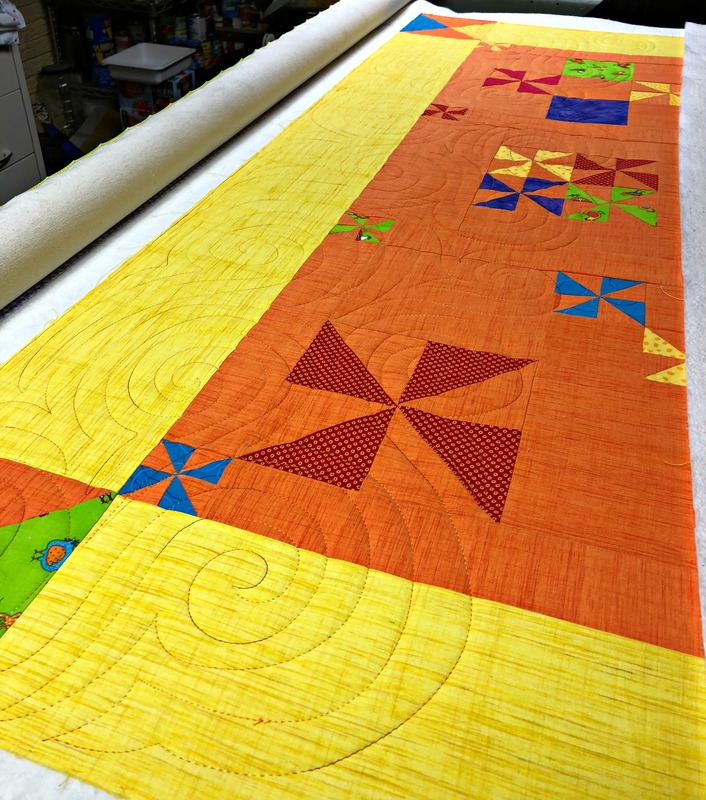 Sooooo……..the top was hung out-of-sight/out-of-mind until I needed this year’s United Way raffle quilt for work. 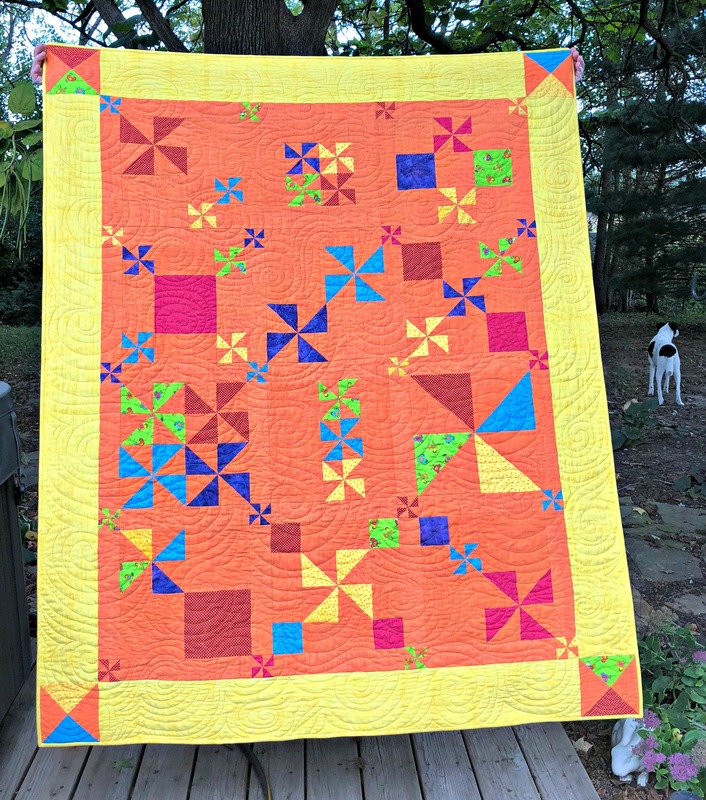 Next thing you know, I made up my mind on the borders, quilted it with variegated thread and got ‘er done! ……broken dishes blocks 😉 Sept was dark/dark blue. It is a sad, sad day. Hot & Steamy I, one of two identical irons I’ve had for YEARS, has finally died. They weren’t expensive. They didn’t develop leaks. They got hot and maintained their temperature. The auto shut off feature kicked in at a decent interval and then heated right back up. 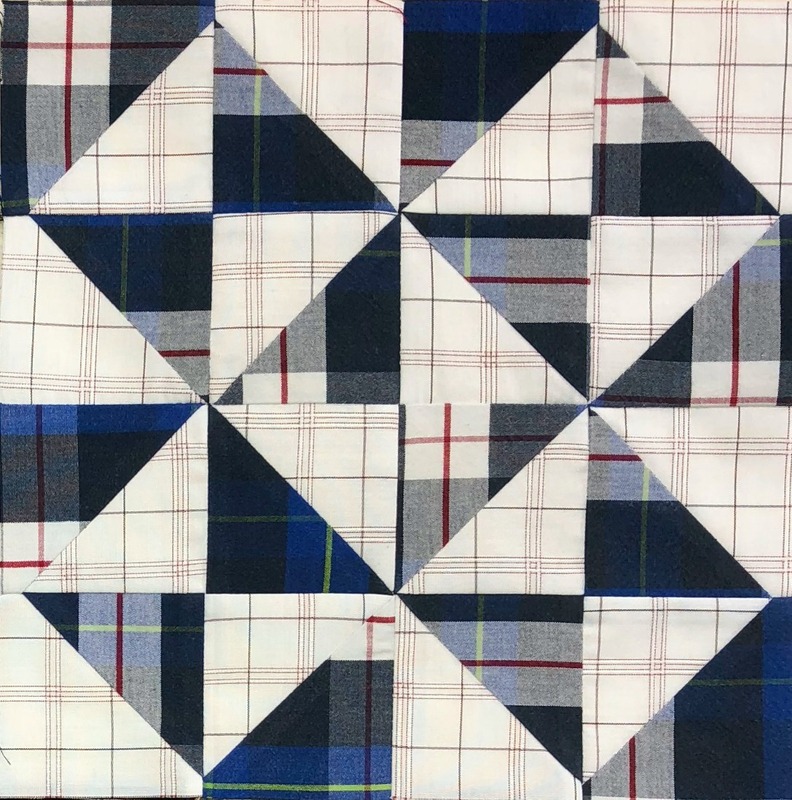 They got their names when another quilter at a sew day exclaimed, “Wow, this iron is hot AND steamy.” You can imagine where the conversations went from there 🙂 She went out with a sizzle….I suspected the end was coming as the plug had started getting very hot. I hope Hot & Steamy II lives on forever. 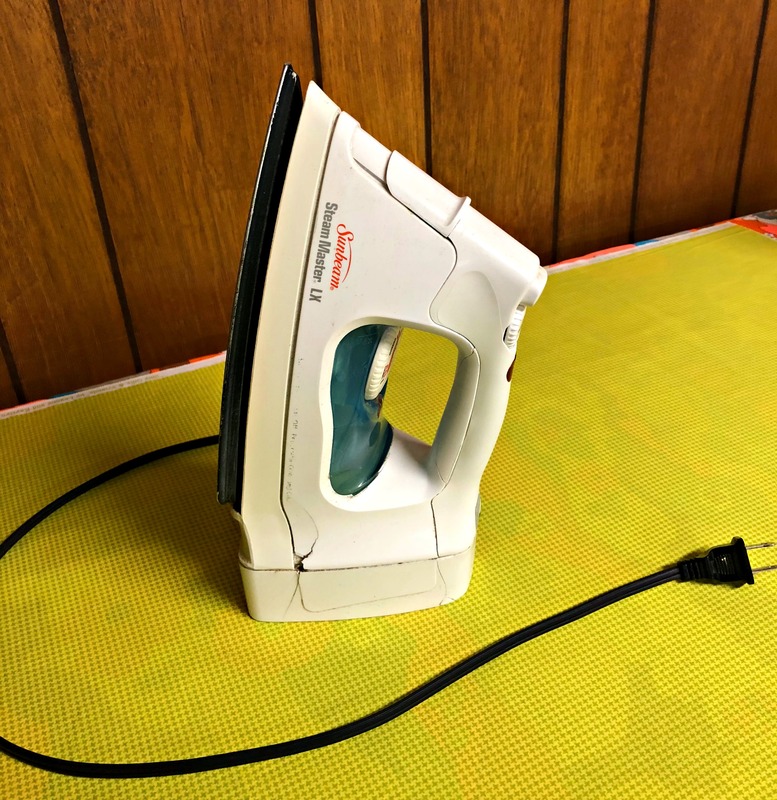 Because, irons, even expensive ones, aren’t made like they used to be……….